Really interesting story about two corporations' takes/positions on keeping a free wi-fi service up and running in the New Orleans region. Following Hurrican Katrina, the govt/emergency wi-fi service was opened up as a free wi-fi service to individuals/companies who badly needed the connectivity. Now BellSouth is in the eye of the storm from the perspective of trying down to shut down this service. They claim they've taken no such position. Earthlink on the other hand, is taking a White Knight position in terms of trying to keep this up and running. I was recently interviewed on a piece about the KFC "hidden message" ad, which ABC so kindly nixed. The interesting angle is that it was by Nation's Restaurant News (NRN) - a trade pub serving the QSR/Food Retail industry, which takes the dialogue from the marketing talking heads to the actual vertical rockface. Also...any piece that interviews both myself and American Copywriter's John January can only be good, right? Haven't really posted a lot on gaming lately...shame on me. 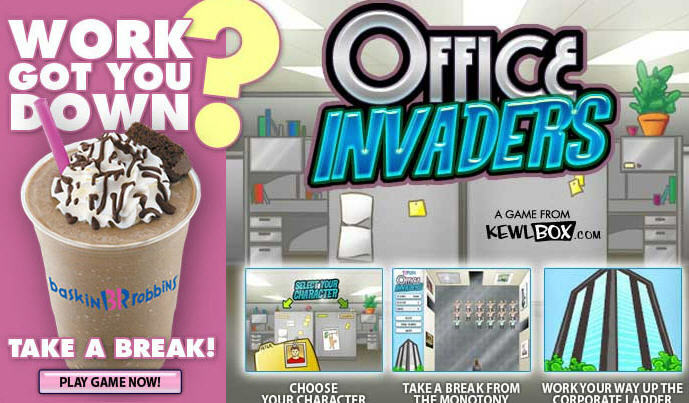 Considering I am here in Vegas for a Dunkin Brands (Dunkin Donuts and Baskin Robbins) Convention, thought I would post about one of their first forays into the gaming space with Office Invaders. Invoking a retro shout out to the Space Invaders era, the fairly addictive game isn't afraid to do a little bit of selling....which these days brands seem to be scared of doing with their online work (from Subservient Chicken onwards...branding is subtle or even...subservient) The idea is simple...Baskin Robbins' Cappuccino Blast give you an edge or boost in the workplace. Some might call that strategic. The game launched on March 6th and to date has had over 400,000 plays. 400,001 including me. And it also does a great job of reminding me why I have stayed out of the corporate world for as long as I have. "People are our most important asset." Riiiiiiiight. Tom Hespos from Underscore Marketing (and a previous host of ATS) had these fine and kind words to say about podcasting and Across the Sound respectively in his Online Spin article. Also, here are some thoughts from Tom from the OMMA conference in Hollywood. Interesting how at an Online media marketing and advertising event, he is picking up such a strange or perhaps disingenuous disconnect with respect to social media. Perhaps it's just the nature of the beast...and the inevitable return to greed, cluelessness, arrogance and opportunism. Tom - for what it's worth - I can't tell you how often the same thing happens to me (i.e. the credit stealing or the epiphanies that occur some 3 years later) I just smile and ignore it now. It's all part of the deal. Join the Jaffe Juice community now! Another CGC gem my friends...this is all genuine footage with a little post production thrown in for brand effect. Wrigley's are you listening? This is sweet. It's the McNuggets' (w)rap and it's worth passing along...it was created without any hint of the grubby paws of advertising and I think it proves that authentic CGC is organic and cannot be controlled, incented, prodded or manipulated. Now the million dollar question is what McDonalds does with this....Buehler, Buehler, Buehler? Aaaargh....get this tune out of my head! I'll throw in a Starbucks gift card for $20 or a copy of Life after the 30-second spot to a random registered reader. Think of the Frapprccino's you'll be able to buy as you read my book. Using my abacus, I deduce that 26 million humans will therefore be sold laundry detergent, feminine hygiene products and Detroit-manufactured automobiles in order to access that video.